They say a photo is worth a thousand words. And I think that this is particularly applicable when the photo captures a genuine moment in space-time, a matter-of-fact event, frozen for posterity. I do not normally like taking photos showing people and have a particular dislike for pictures which include posing humans. However, there are occasions when a perfectly natural photo, untainted by the artificiality of posing, says so much more because there is a human being in it than if it were to only feature inanimate objects. This particular photo is a favourite of mine. A woman rowing a small boat from one of the larger luzzu in the background to the shore. Probably after having delivered some food or supplies to her fisherman husband who is preparing for his next trip to sea on his vessel. 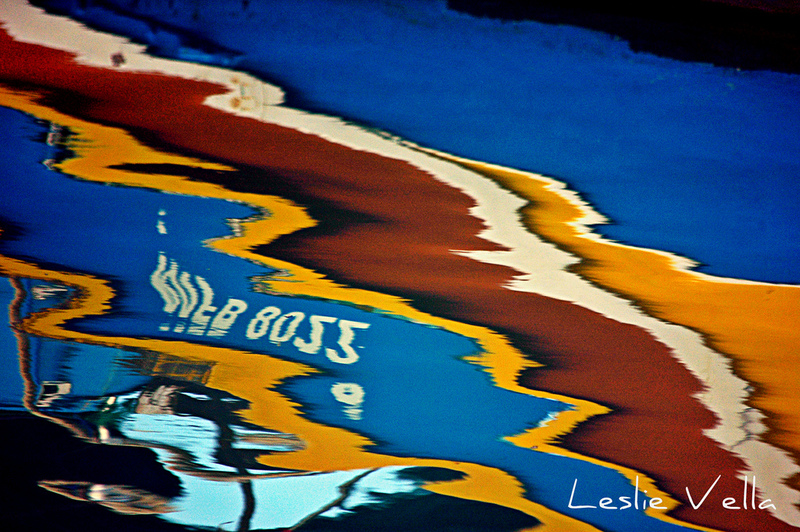 A woman of the sea, for whom the transition from land to sea comes naturally and with no fuss. Bearing the clothes she wears at home and rowing the boat with grace and skill. 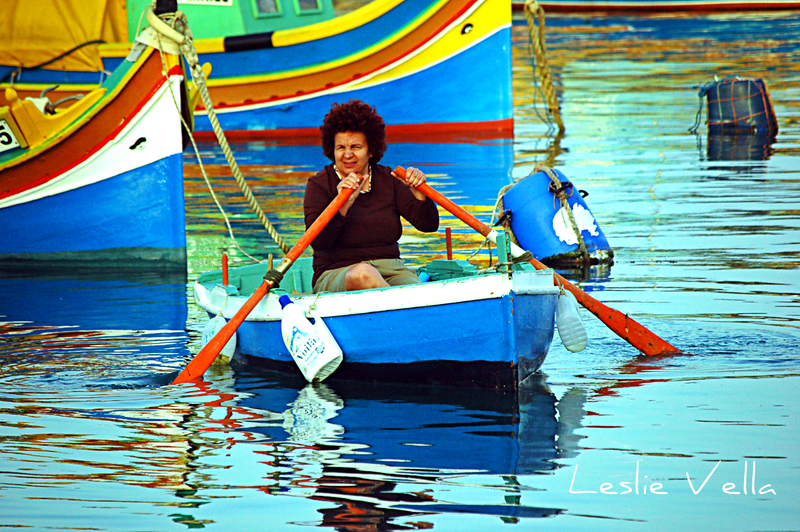 The beautifully coloured luzzu, the calm inner waters of Marsaxlokk harbour and the graceful paddle of the oars are all factors which contribute to make this photo special. I also love the small details: the boat fenders which are actually used detergent bottles and the larger buoys which are actually plastic tanks in which imported olives are consigned. A culture for whom re-use and recycling are not newly discovered fads but practical realities which they have long practiced. A photo which does not feature a model chosen on the basis of looks wearing clothes specially selected for the occasion, but a split second snapshot of life in Marsaxlokk, Malta featuring a real person in her day to day life in a Mediterranean fishing community. 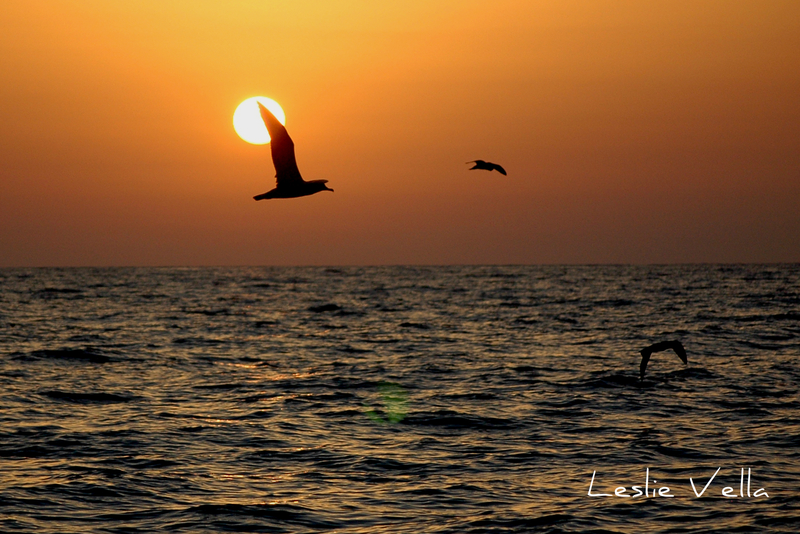 For most landlubbers, seabirds are a rare sight in Malta. In fact most people only witness these fantastic birds in stormy weather when some species, particularly gulls, shelter in harbours and inlets. However, their relative lack of visibility is not due to their scarcity alone but is also due to their elusiveness. Maltese seabirds are shy, mostly nocturnal creatures which tend to congregate in inaccessible areas as far as possible from human activity and interference. The best places for seeking such creatures are cliffs and isolated places such as the islet of Filfla where a substantial colony of Storm Petrels, one of the largest in the Mediterranean in fact, is known to thrive. 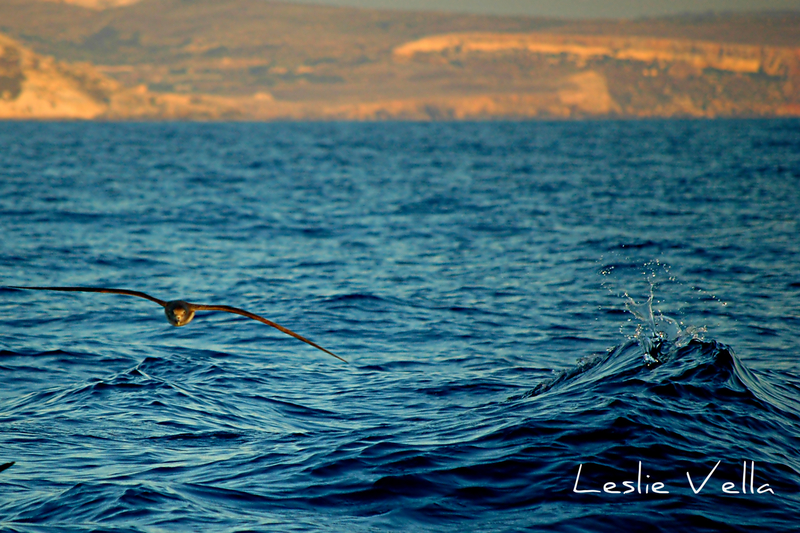 Shearwaters are another species which is relatively common in Maltese territory. The more common Cory’s Shearwater is a common migrant which is generally present between March and November where it breeds in crevices in the rocks, while the rarer Yelkouan shearwater, of which Malta holds around 10% of the global population, is most commonly associated with the Rdum tal-Madonna cliff-face at l-Ahrax tal-Mellieha, where a third of the Maltese population of these birds resides! 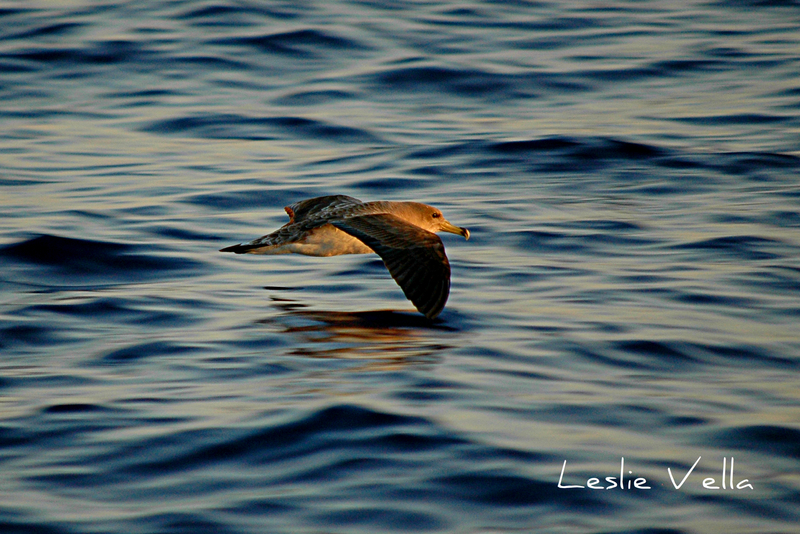 Shearwaters, so called because of the way they skim the water’s surface when flying low as if shearing it, are very avid travellers and birds which have been tagged in Malta have been recorded as far away as the coast of Senegal in the African Atlantic. They are also famous for their human-baby like cry which is especially haunting if heard at night from the cliff-tops where they nest. During the summer evenings the nesting shearwaters congregate in huge quantities just beneath the cliffs of Ta’ Cenc in Gozo after a day out at sea. This phenomenon is known as rafting and involves hundreds of birds flying low from their distant maritime haunts to eventually settle on the water in sizable groups until the darkness sets in. I experienced this beautiful phenomenon in the early summer of last year with a group of nature-appreciating enthusiasts. Having set sail from Marfa jetty on Malta we progressed to a site beneath the sheer cliffs of Ta’ Cenc in Gozo and the birds started arriving. After a slow start, the group grew to a few hundreds and provided a veritable spectacle apart from numerous photo opportunities for those on board. The show ended with the sunset and the brief Maltese twilight but left me with the warm feeling enjoyed by all of those who, like me, derive pleasure from appreciating the simple observation of natural beauty. The fishing boats of Malta are instantly recognisable by their colours: a deep marine blue, a terracotta red and a pastel yellow interspersed with streaks of white and green. All natural colours reminiscent of the land, the sea, the sun and the green fields. Most boats comprising the island’s fishing fleet tend to follow this informal arrangement with each individual vessel sporting its own combination of the iconic colours in varying patterns and arrangements. The biggest concentration of fishing boats is to be found in the sizable fishing village of Marsaxlokk on the main island of Malta although other examples can be found in Birzebbuga, Marsascala, Marsamxett Harbour, St. Julians and St. Paul’s Bay on Malta and Mgarr Harbour and Marsalforn on Gozo. 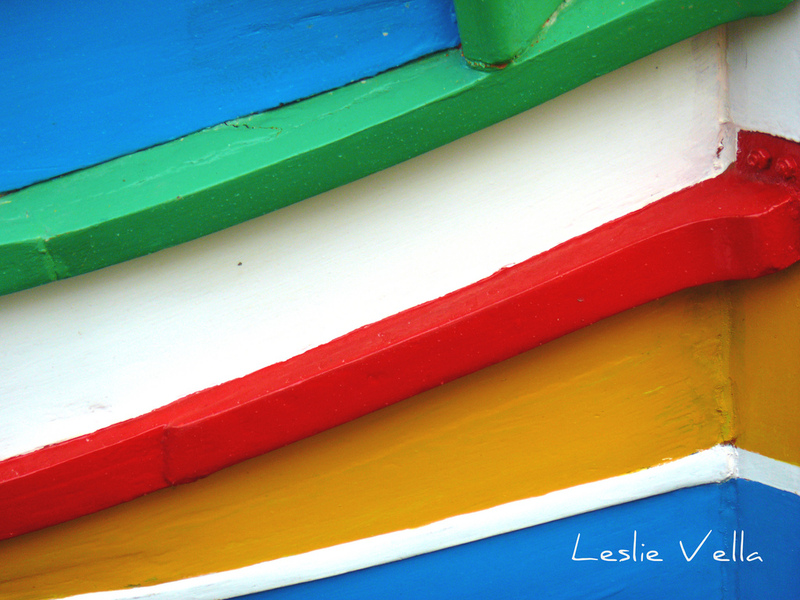 The ubiquitous colours of the boats make them ideal subjects for tourist literature and their shapes, profiles, colours and details have been used for generations upon generations of tourism advertising and branding for Malta by the tourism industry. But contrary to the expectation that such a brand-like set of markings is the result of some marketing agency’s handbook, these instantly recognisable colour schemes date back at least three centuries and must have already prevailed during the last decades of the Knights of St. John’s rule in Malta. Most probably they constituted a practical way of recognising one’s own compatriots on the high seas of the Central Mediterranean especially when competing with fishing fleets from neighbouring Sicily and Tunisia during the fishing season. 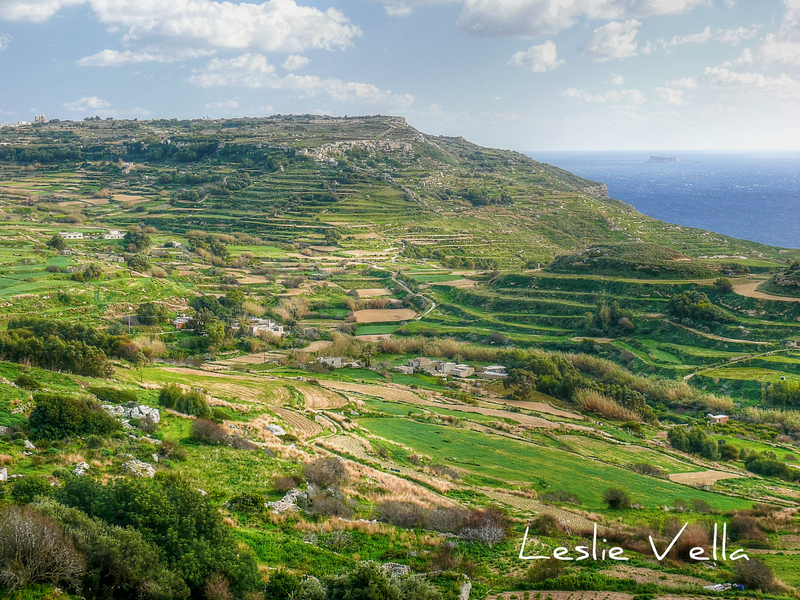 A sweeping view of the undulating countryside on the north-west coast of Malta as seen from the hamlet of Mtahleb. The steep cliffs of the coast are intersected by numerous water-carved valleys, the sides of which have been carefully terraced over the millennia to preserve soil and retain moisture. 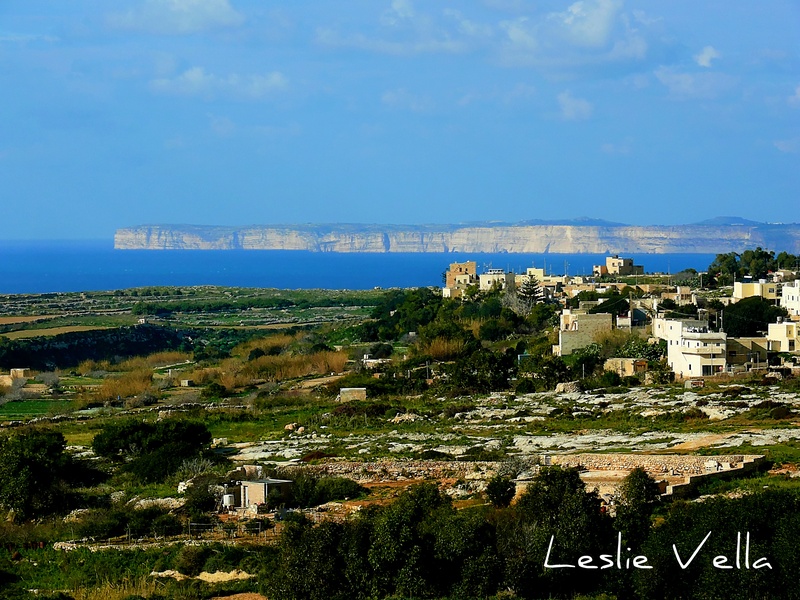 Visible in the top left corner is the skyline of the village of Dingli, capped by its church dome. Dingli, which gives its name to the Dingli Cliffs is the village with the highest altitude in Malta reaching almost 250 metres above sea level, with temperatures averaging two to three degrees cooler than the densely populated harbour conurbation to the south. The January landscape is mostly monochrome green as the wild flora which is reborn after the parched summer months covers all available patches of soil. This landscape will soon convert into a riot of colours as the multitude of floral species burst into all the colours of the spectrum between mid February and April/May. The top right of the photo also shows the miniscule, uninhabited islet of Filfla which lies some five kms to the south-west of Malta and was originally part of the mainland until geological upheavals led to severe faulting and its eventual drift from its parent landmass. The white cliffs of Gozo rising sheer out of the blue Mediterranean seen from the high ground at L-Imtahleb on the north west coast of Malta from near the village of Bahrija. Similar to their famous white counterparts on the English Channel they are composed of calcium carbonate limestone, comprising the fossilised sediments of billions upon billions of marine organisms deposited on the ancient seafloor between 20 million and 40 million years ago until the pressure of the African Plate pressing into the European Plate thrust them above sea level. Although the Dingli Cliffs on Malta rise to almost twice the height of the Gozo cliffs, they are not as majestic in that they are not as sheer. The island of Gozo lies to the north west of Malta and is separated by a narrow channel some five kilometres wide in which nestle the small islands of Comino and Cominotto. Malta, a thimbleful of rocky islands in the central Mediterranean, 100 kms south of Sicily, 300 kms north of Africa. 300 square kilometres in a group of seven islands three of which are inhabited. 420,000 people call this small country home. An archipelago of honey coloured limestone rising out of the cobalt blue Mediterranean, a place boasting six millennia of unbroken human activity, a location which surprises through its Lilliputian complexity. Join me on this trip where I shall be primarily using the medium of photography coupled with short write-ups to present different facets of Malta and its islands. And give me your feedback if possible. For my first photo I have chosen an aerial shot I took while on a departing flight from about 7,000 feet altitude. 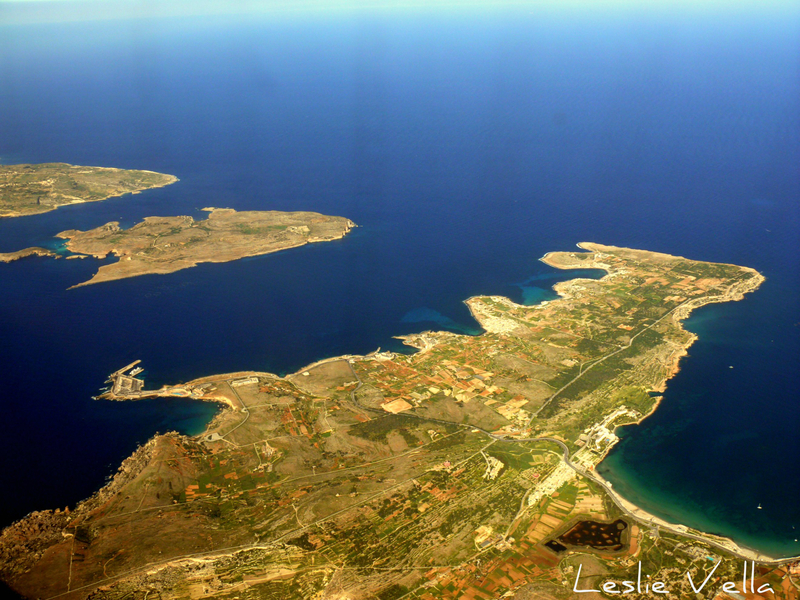 The foreground shows the northern tip of mainland Malta with the islands of Comino and Cominotto in the centre and the south-easternmost tip of the island of Gozo in the background. This is a very undeveloped part of the archipelago and is mostly famous for its beaches and its unspoilt countryside consisting of exposed ridges and sheltered, fertile valleys.